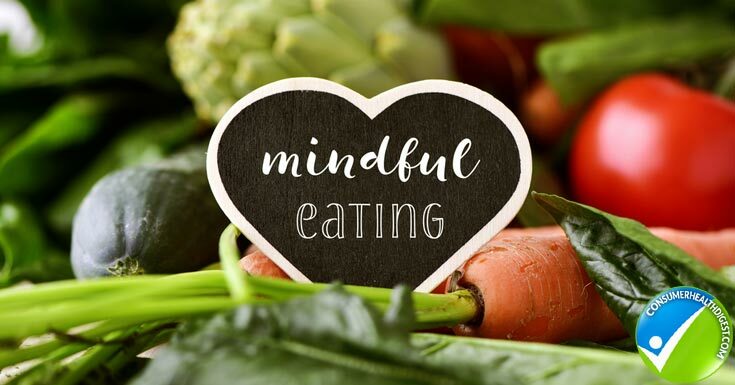 Mindful eating is not a calorie diet, it is a stress diet. It gives way for stress reduction during one of the things we do, not just every day, but multiple times a day – eat! Imagine if we had a way to reduce stress in every action we participated in every day. What would that look like? What would that feel like? For me, it would be like swimming up to a beach bar every night, or getting paid to play with my dogs all day long! But that’s not “real life”, right? So the goal is to find that feeling with everything that we do. The secret is in being one million percent present. Here. Now. In. The. Moment. One. Breathe. At. A. Time. One. Thought. At. A. Time. Easier said that done? Maybe, but maybe not. Like anything else, it just takes practice. So let’s start with the foundation. What is mindfulness? It’s not just a trendy corporate buzzword to get generation X’ers to sign up for that hot new yoga class because their jobs are killing them. It’s actually a state of being, going back thousands of years. Mindfulness was created to improve health. Science has proven time and time again that stress kills. Stress is the number one reason we have heart attacks, put on weight and even develop cancer. Before the healthcare system became a political game of monopoly, we actually hired shamans, monks and healers to teach us meditation and to be present. I first learned about mindfulness by dedicating myself to overcoming a deathly fear of roller-coasters. Every time my sister would force me to go on Splash Mountain or Space Mountain or Death Mountain (that’s a ride, right?) I would start to go into a panic. My thoughts did not exist in the present. They were only in the future. “We’re gonna drop soon. Oh sh*t, I hate the drops. When we drop, I’m going to hate it…” all the while NOT breathing. So we click-click-click our way up the track, and I’m scrunched in the seat, behind the flimsy bar wondering if I left enough cat food out for them to survive on while the coroner deals with my dead body after the ride goes south. And then I look over at my sister, who is sitting upright, smiling ear to ear, breathing it all in. I thought, “What is happening over there?! Why am I suffering and she’s having a blast?” and the main difference I noticed is that she was BREATHING! What a concept. This thing that we can’t live without, and here I was, not doing it, afraid of dying, because of it! So I started to breathe, taking deep healing breaths, I even forced a fake smile and looked over at her like, ‘Yeah, this is super!”. 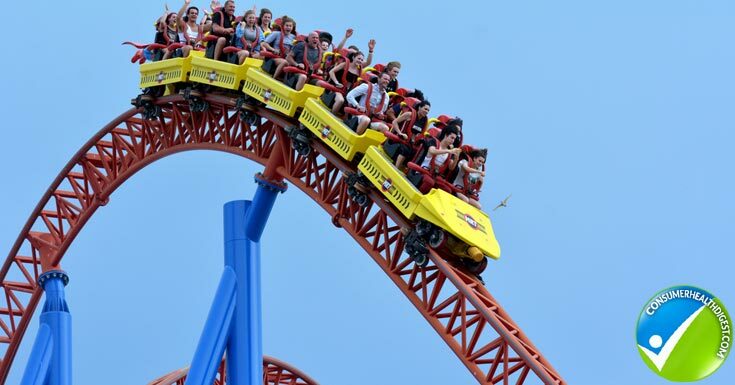 She just laughed at how terrified I looked, and then we DROPPED down the track, over the curve, UP then DOWN – OMFG! BUT I continued to breathe, and smile. And tune into how tight my hands were gripping the bar and relaxed them a little (not too much, just a little). I noticed how nice the wind felt in my hair as we moved through the ride. I took in how happy my sister was, and how good that made me feel. 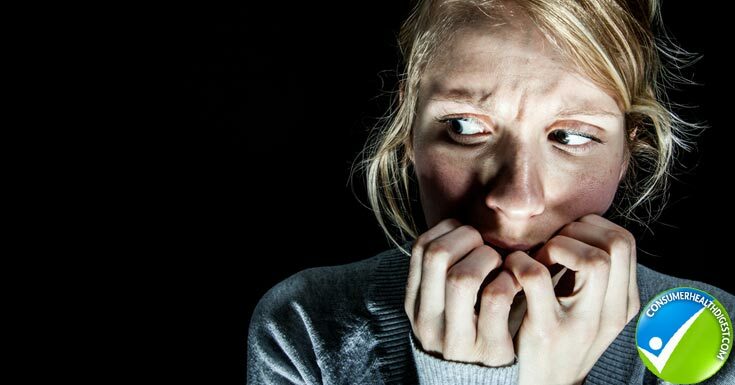 Fear means: False Events Appearing Real because I’m not actually close to death. I just thought I was because I wasn’t previously present. Your mind can only be in one place at a time; the past, the future or the present. When you are totally present, there is no room for fear because you know that you are actually safe. One of the main reasons we overeat is because we are mindlessly dumping calories into our bodies. When I was in school, I bought a diet book and the first page said, “Don’t do anything but eat.” And I thought, “That sounds great! I love eating!” But what it really meant was to not distract yourself from eating. That’s how you lose track of food, the same way you lose track of time. That realization was a bit of a bummer because I was actually hoping I could eat my way to being thin. But that’s only half true. I could eat my way to being thing NOT by sitting around eating all day but by being fully present while eating. Was it boring at first? Maybe. I was used to filling my gullet while binging on X-Files reruns, not focusing on what each bite tasted like or how much I chewed before swallowing. Being present is never boring if you are truly present. If you are in the moment, then you are at peace, which is our natural state of being. It’s the rise-and-go mentality that has become the norm we are now trying to undo through these practices. 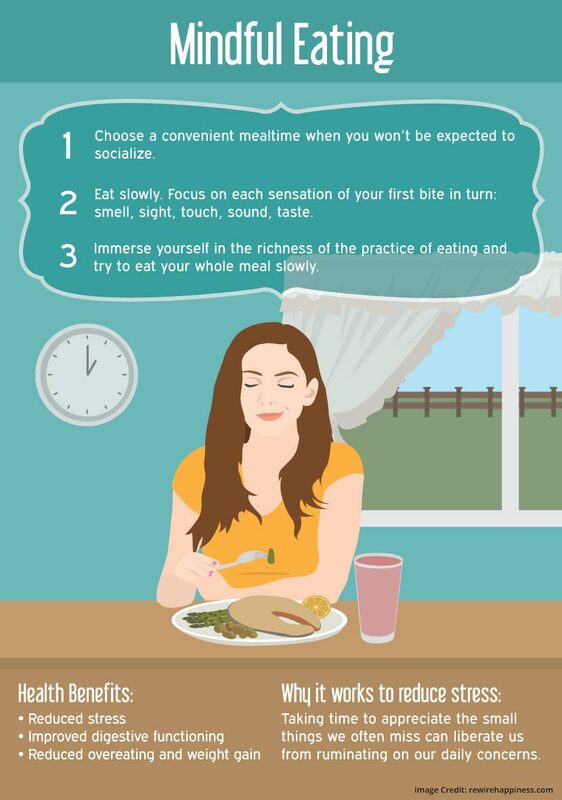 Mindful eating is a way to break down each step of eating. Going back to giving gratitude to where the food came from (such as visualizing it on a tree, a farm then in the store), being in your home or at the restaurant you’re at, then the moment by moment experience it being eaten by you. With every bite of food you are, feeling it in your hand (or as weight on the utensil), seeing it, smelling it, it touching your mouth, going into your mouth, chewing it, then swallowing it. Our intestines are the only other organ in our body, besides our brain, that has brain cells (hence the term “shitting your brains out”). Every time we chew, our intestines mimic our jaw. As our mouth goes up and down chewing our current bite, our intestines chomp and compact and break down the last few bites. The saliva in our mouths helps to break down our food before it goes into our stomachs. So if we don’t chew our food, properly we don’t get enough of that awesome breaking-down-food saliva, and our intestines won’t be mushing the food to properly form our poop. We don’t allow our bodies to have the conversation they want to have to keep us at our optimum health because we are barely chewing, and swallowing food faster than we are chewing it. No wonder we’re bloated, inflamed and overweight. We did this to ourselves! We should be chewing our food to mush, to where we are mindfully observing it becoming liquid in our mouths before we gently feel it slide down our throat hole into our body. Noticing the temperature of it as it goes down. And as we reach for the next bite, we should take in the beauty of the bite, the smell, the shape, and let it sit upon our lips for a few moments until we salivate. As it enters our mouth, we give thanks and feel the joy of getting to eat this delicious thing we’ve chosen to eat! When you decide to take a mindful journey of where the food came from and how it has found its way to you, you will probably eat less meat and processed food. Not sure about you, but I’m not interested in taking a mindful journey into a deep fryer or at a slaughterhouse. But what I will do is see the animal and say thank you for the healing food it provides, and skip the sad parts, going right to the moment by moment experience of what it feels like to just eat. It’s just not practical to feel guilty or grossed out every time we eat, so pick and choose your food according to the mindful experience you want to have. You may be surprised at how your life changes, as well as your diet. Now go chow down… Very slowly.